Our existing landfills are nearly maxed out... and the next landfill may cover your favorite trail. Reduce, reuse, recycle. You’ve heard it before, but what has it got to do with riding? Well, in a place as small as Hong Kong, it means everything to the future of our sport, and our health. Our landfills will be COMPLETELY FULL in six years, maybe less. Yes, that’s right. The amount of waste we produce is accelerating. The EPD is most likely going to have to start burning our filth in a yet-to-be-built incinerator, which means we get to breathe it while we ride. That is, if our favourite trails are even open, given that land supply is shrinking – some of the areas where we ride and/or the HKMBA is evaluating for new trails are either on or near a landfill, or could possibly in the future become one. As the Government says, “If the waste loads continue to increase, there will be a need to allocate an additional 400 hectares of land to develop new landfill sites to meet our waste disposal needs up to 2030. Clearly, Hong Kong needs a more sustainable way to deal with waste.” No kidding, 400 hectares - that’s an area TEN TIMES the size of the new West Kowloon district, which will last us less than 20 years. Where will all the rubbish go? Right next to your trails, if we don’t cut down. If and when you buy new gear, don’t chuck the old stuff – sell it or give it away on www.28bike.com, or leave it with a bike shop, to put in their spare parts bin. Throwing away tubes, even ones that can’t be patched, is incredibly lame. It’s like throwing away a perfectly-good roll of duct-tape. Pack your lunch in a reusable container, or eat out. Throw-away lunchboxes are one of the biggest sources of the 6 million tonnes of rubbish we throw out each year. Think about what you throw away throughout the day, and consider a reusable alternative. Other than toilet paper, most disposable products don’t have to be so. Buy less ‘stuff’ – and when you do purchase something, request less packaging. so what is in store for MTB in HK for 2013? Well they said that 2012 was the end of the world, or at least the end of a cycle … and maybe it was. One thing is for sure, 2013 is going to be a revolutionary year for Mountain Biking in Hong Kong. New trails have been opened with partnership of the IMBA and AFCD, which offer beginner and intermediate riders something other than the white-knuckle death-defying descents that typify local gravity trails, and progress continues to made on the trails at Tai Mo Shan in particular. A new entrance to the ever-popular Ho Pui contour trail will open in March, to be followed later in the year by a revisitation of the ‘Tai Mo Shan Classic’ in all its lung-busting, arm-pumping glory. There’s never been a better time to ride a mountain bike in HK. There has been an explosion in the number of bike shops offering quality offroad bikes in the past year, and now more than ever there is a demand from trails as new riders venture out to get a taste for the trails. On the other end, expert riders have enjoyed ripping it on their favorite tracks, competing against one another virtually using smartphone programs like Strava. Although the HK Cycling Association has been experiencing some ‘technical difficulties’ when it comes to putting on races, other organizers have come along to fill the demand – and we will be sure to keep you posted. Several races have been held at the MX club in Fanling, for example, and more will follow. In the fall, quite a few Hong Kong riders had the chance to ride with Steve Peat, Wyn Masters and Brook MacDonald in Chiang Mai, Thailand when a race was held there. If you missed out, don’t worry – Red Bull is planning to bring Gee Atherton to town this spring … details coming soon. Lastly, as more riders make their way to the trails, and hikers crawl away from the air-conditioned crevices they’ve been hiding in, user conflict can become more of a problem. So for the good of all, and to keep the good times rolling, PLEASE read and re-read our notes for ‘Sharing the Trail’ – and help us to keep opening more trails. Story Update (Feb 8,2013): Note that the BMX Park remains open, however the hours are very limited. Check with the BMX Park for details. The recent Asian Games Champion in BMX, Steven Wong failed a drug test in the spring of 2012 and is now serving a two year ban.. Unfortunately, bad decisions get made. Raw deals get taken, sometimes without the consent of major stakeholders. Such is the case of the Jockey Club BMX Park, which is now closed to the public indefinitely due to an epic management fail on the part of the Hong Kong Cycling Association. Riders will be petitioning for the re-opening of the park at the association’s General Meeting on January 15th, and a new committee will be formed in the meantime. Those responsible for signing the original deal no longer work for HKCA, but it is unclear what will happen next, as the association is now taking legal advice. When the park was opened, with HK$20 million in funding from the Jockey Club, the HKCA signed a deal with the Environmental Protection Department under which the HKCA would be responsible for managing the park, but the park itself, with staff chosen by the HKCA, would be ‘responsible for its own profit and loss’ – in other words, it had to be self-sustaining, and couldn’t receive funds from HKCA, which is supported by Home Affairs’ Sports Development Fund. Thus, with no experience in running a for-profit business, the orphan child of HKCA became a money pit that was costing HKD$200,000 per month, including $20,000 per month in rent to the government. Over the next three years, a private individual who held a position at the HKCA is said to have contributed something to the tune of HKD$7 million just to keep the gates open – but with the park continuing to bleed money, those gates are now locked. The park, which has bred one Asian Games champion and two world champions, is closed until someone figures out how to make this work. If you are an HKCA member – in other words, if you have filled out the forms you need to race with them – do your part and show up at the General Meeting on the 15th and ask questions. The association, which also puts on Downhill and Cross Country races, has not been the most transparent organization in the past, and we hope to see more community involvement in how races are run. That starts with you. 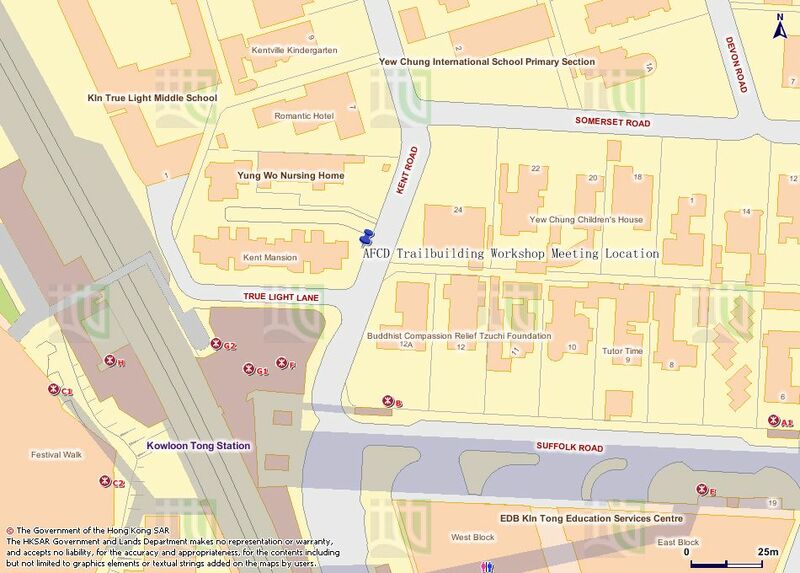 Digging Resumes in TAI LAM CP this DEC in and you are invited to join in the ON the fun. The AFCD is inviting HKMBA members to participate in trailbuilding workshops to be held in Dec. IMBA trail specialists HM Lim from Singapore and Chris Kehmeier will conduct the workshops and supervise the work. The work location has not been determined yet but we will update page this as we know more. AFCD has reserved 15 spots on each of the days for HKMBA members (but this is likely to increase). These spots will be allocated on a first come, first served basis. The HKMBA will collect the names of interested volunteers and forward them onto the AFCD. 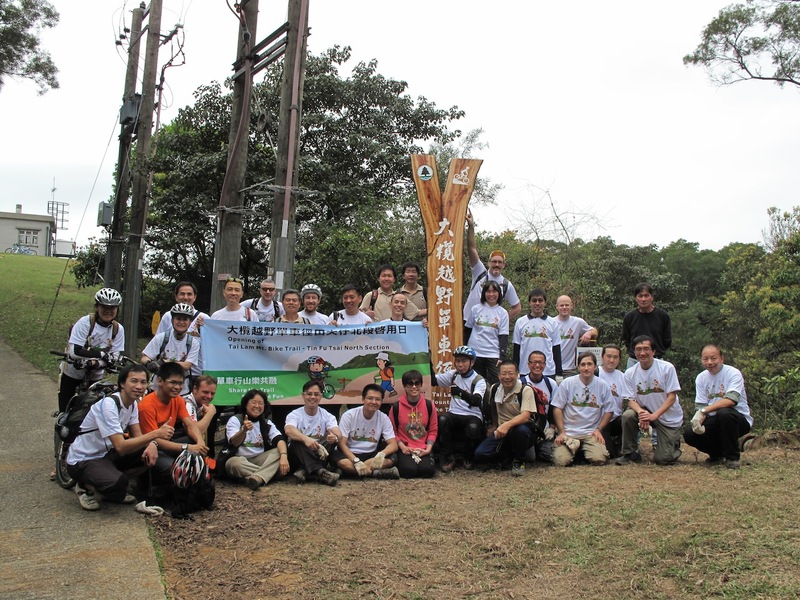 The last series of workshops were a big success with over 60 HKMBA members helping construct HK's most recent legal MTB track, the Tin Fu Tsai North MTB trail. Its hard but very satisfying work. You'll get a chance to learn trail building techniques from the very best around and its all free courtesy of the AFCD. So act quickly and sign up! Venue: meet at Route Twisk Management Centre at 9:00am, then we shall depart to the work site after a short seminar. 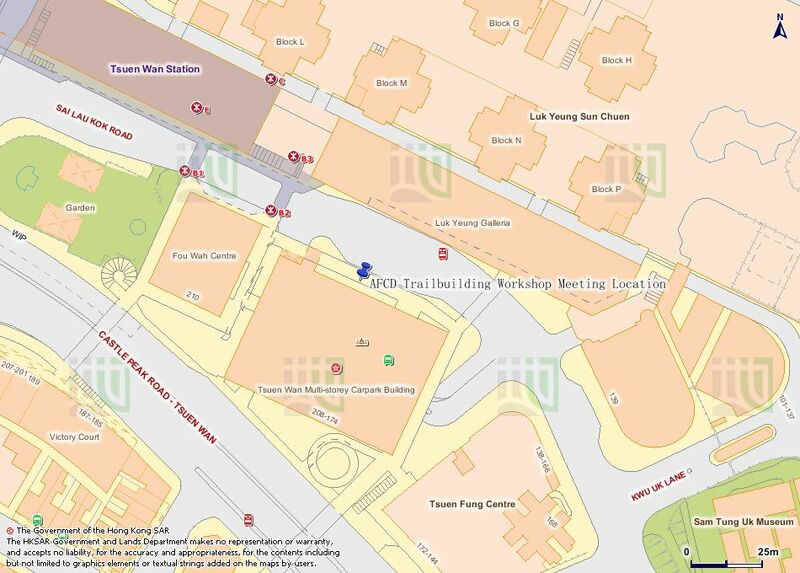 If you cannot make your own way to the AFCD Route Twisk Management Centre, AFCD will supply a 24 seat coach to meet volunteers at the Tsuen Wan and Kowloon Tong MTR stations. Look for the bus with the sign "AFCD Mountain Bike Trail-building Workshop" in the windscreen.